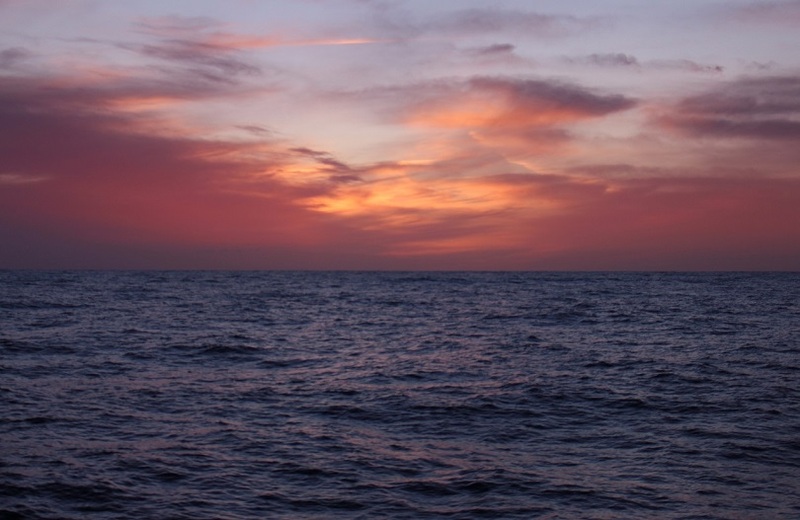 UK Shelf Sea Biogeochemistry Blog: What is happening in the benthos? The seas picked up again on Saturday and unfortunately again a few members of the science crew have been feeling a bit green, however the strong winds left us on Sunday and we had our first days’ proper sunshine of the cruise, complete with the obligatory sunset photograph, but not the fabled green flash! 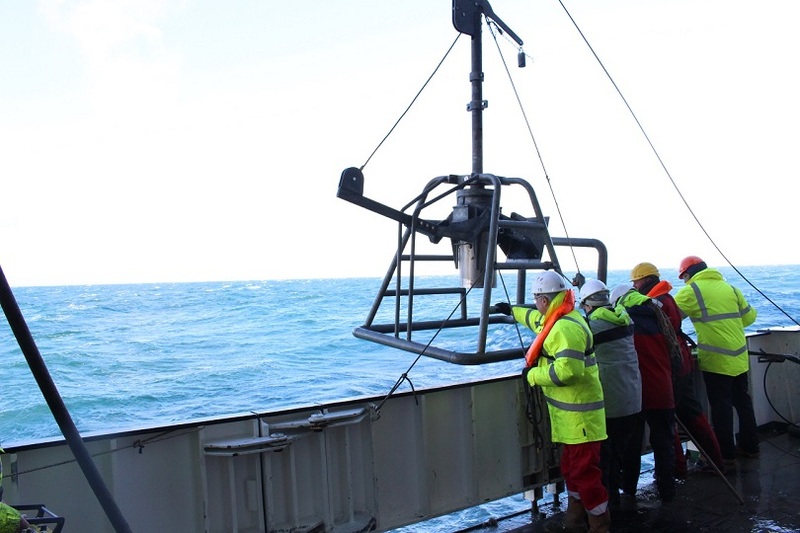 The focus on this cruise is on processes that are happening in the benthos – meaning the environment above and within the seabed – and how these processes change as the seabed moves from sandy sediment to muddy sediment. To do this we are investigating four sites which are characterised as sand, sandy mud, muddy sand and mud. We managed to complete the NIOZ coring of the sandy site (Site G) over Sunday night, giving our sedimentologists some sandy samples to analyse along with the muddy sediment collected from site A.
Natalie Hicks (SAMS) is using the samples collected by the NIOZ corer to investigate the dynamics of benthic carbon cycling, including how deep and for how long carbon is stored in the different types of marine sediments, and how much is released back into the water column. 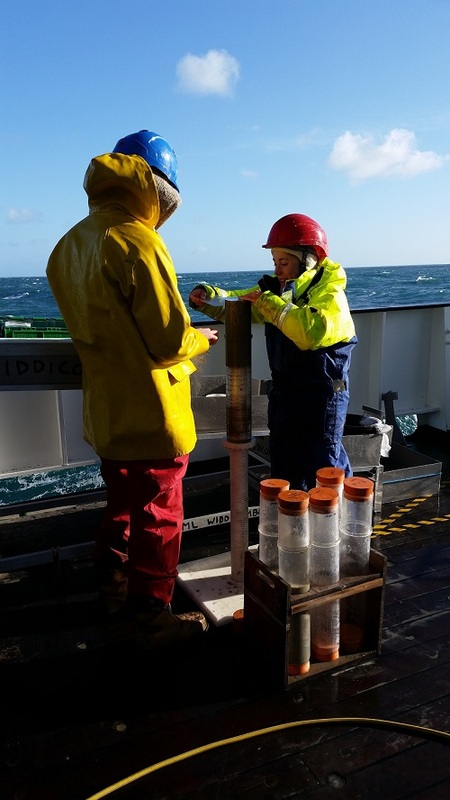 She is collecting sediment samples from the seabed to a depth of 25 cm and then slicing it into cross sections, with each slice containing sediment from a different depth. These will then be stored in a freezer until the end of the cruise, when they are taken back to the laboratories in the Scottish Association for Marine Science (SAMS) to be analysed. 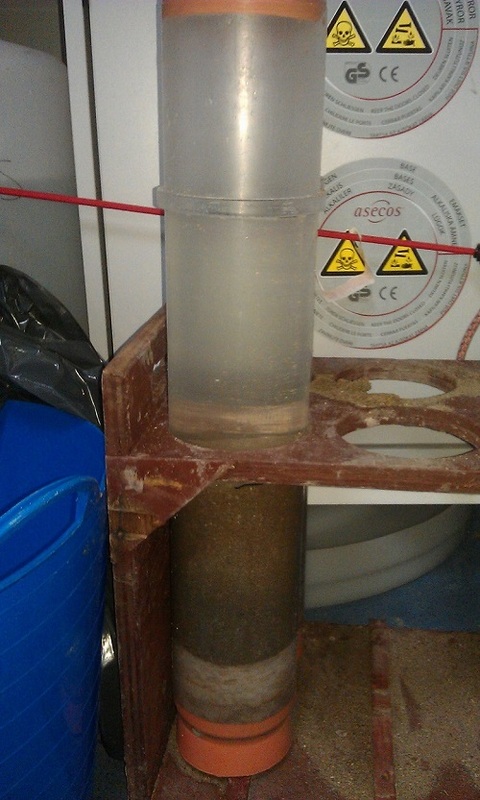 Back at SAMS, the sediments will be analysed for their porosity, which refers to how much space there is for water between the grains in the sediment. Muddy sediment has smaller grains which fit together more tightly than sandy sediment, leaving less space for water between them. This makes it easier for pockets of water deeper in the sediment to be cut off from the sea water above. Once this happens the water in the pocket will quickly run out of oxygen (there will be more about this later in the blog), making it impossible for aerobic bacteria (they are the ones requiring oxygen for respiration) to consume the organic matter in the water. This organic matter will then be stored in the sediments, unless it is resuspended through physical water movement or animal activity. All of this is important so that we can determine whether each sediment type is a source or a sink of carbon. If we can understand better how deep carbon needs to be buried in the different sediments before it is sequestered (stored permanently in the seabed sediments) and how long it will stay the sediments for, then we can know how much carbon they will absorb over time. This will help us predict how much atmospheric CO2 may be buried in our marine sediments over a certain timescale. The rains and rough weather returned on Sunday, however I think most of us have our sea legs now!